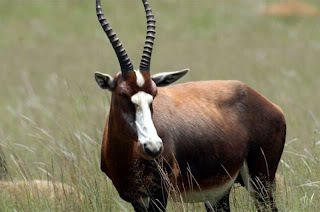 The Blesbok Damaliscus pygargus phillipsi is a fine looking antelope that lives on open grasslands in parts of southern Africa. Good places to see it include the Mountain Zebra, Willem Pretorius, Karoo and Golden Gate Reserves in South Africa. Males (rams) in particular are fine beasts with a deep brown-chestnut coloured coat and a smart white facial blaze.